SAME GREAT GAME, NEWLY DESIGNED!! My eldest is always asking, “Which way is right?” or “Which way is left?” There are some great “tricks” out there, but they don’t seem to be working. I really needed a game we could play that would be fun AND teach him left and right. Here is what I came up with. Cut out the dogs and bones. Cut the path template along the dotted lines and assemble as shown below. Print the playing cards and the “WOOF” paper back to back, then cut them out. Stack them face down for play. 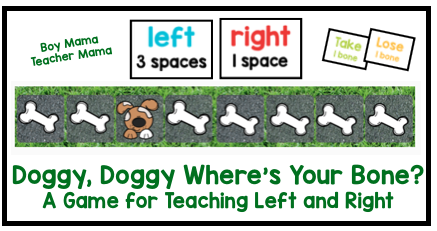 Each player chooses one dog playing piece and places it on any space along the path. Place a bone on all the other spaces. Stack the cards face down. Player 1 picks a card and does as it says. If the player lands on a space with a bone, he takes it. If there is no bone, then he does nothing. Then player 2 takes a turn. Add new bones to the board as you go if desired for longer playtime. The game continues this way until all the bones are cleared from the board. If requested, the “winner” has the most bones at the end of the game. A really clever but simple game. Well done. You always put so much time and effort into your resources. Thank you for sharing them with us. It’s interesting when they start to be interested in right and left, and direction 🙂 Also loving the new sized pics! You are such a creative puppy (he he he he). I love this. Luckily, Miss Poss has got this down pat. It just came from her wearing a watch for a few days. She knew that the watch had to to on a particular side and remembers which one is left because that’s where a watch has to sit. Kids! This is amazing! I have been wondering when I should start introducing left and right to my daughter. I think I will gauge and see how much she will understand playing this game. Thanks for sharing! You are an amazing genius, Stephanie! 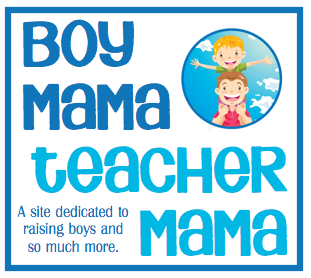 It is so delightful to see your creative spirit shine through Boy Mama Teacher Momma. I love it!